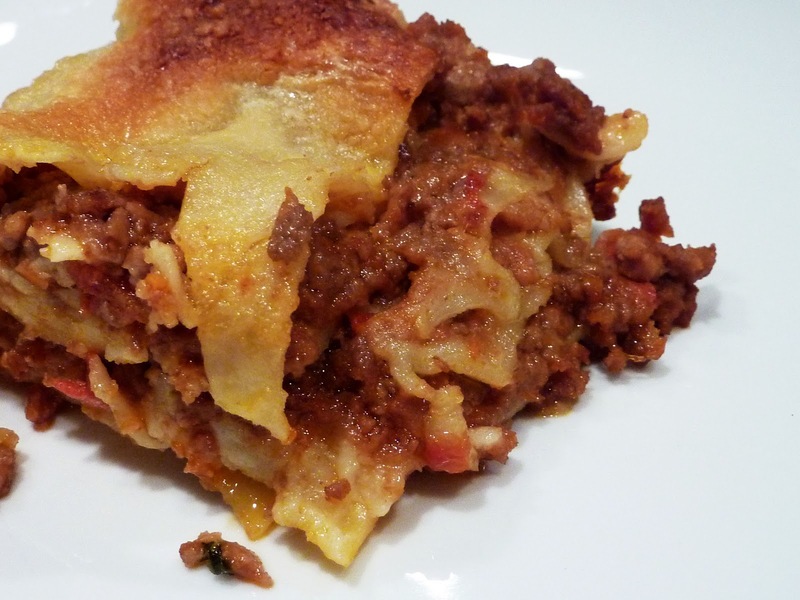 Lasagne comes in so many variations, one could spend hours reading all of the different recipes. For me, this one is the classic. My inspiration is the way it is served in Bologna, Italy, with a savory ragu meat sauce and bechamel sauce. Any lasagne which features ricotta/spinach/or cottage cheese is most likely an American adaptation. This one is simple yet time consuming to make. In my opinion, it is worth every bit of the effort. So give yourself some time, pour yourself a glass of wine, and enjoy the lasagne making experience. Your diners will thank you, and the leftovers will be fabulous. 2 9oz. boxes of Barilla no boil lasagne (one might be enough depending on the size of your casserole dish, but better safe than sorry. If you have a chopper, for me this is the easiest way to get started. In your chopper, put the carrot, celery, onion, garlic, and bacon. Cut the ingredients into uniform size pieces before putting in chopper. Then pulse the chopper until everything is pretty finely chopped. Heat the olive oil in a large saucepan, and when it is really hot, and the vegetable mixture. Saute over medium high heat until everything becomes nice and golden. Next add the ground meat, and stir occasionally until the meat is nicely browned. Add the red wine to the meat mixture. Bring to a boil, and stir regularly until most of the wine has been absorbed by the meat mixture. Add salt to taste. Now add the milk, and a little bit of nutmeg. Continue cooking until most of the milk been absorbed. Next add the chopped tomatoes, sugar and oregano. Stir all the ingredients together, then reduce the heat and let simmer for 1-2 hours if you can. The sauce should take on a brick red color. Sauce should be quite thick, but if is too thick, you can add a little bit of canned tomato sauce (puree) until you get your desired consistency. If the sauce will be used for lasagne, you need it to be thicker. Your sauce is ready! Melt the butter in a small heavy bottom sauce pan. Add the flour, and stir with a wooden spoon for about 3 minutes over medium heat. In another small sauce pan, heat the milk until almost boiling. Gradually add the milk to the butter/flour mixture, stirring constantly. A wire whisk is helpful to avoid lumps. Once all of the milk has been added, bring to a gentle boil, and cook for 5-10 minutes, stirring almost constantly. Sauce should be somewhat thick. Season with salt pepper and nutmeg, stir well, then remove from heat. Once the ragu and bechamel sauce are made you can assemble your lasagne. First get our your baking dish. I prefer to make a smaller dish with more layers, say 8 x 10 inches. You can use a 9 X 13 baking dish and have fewer layers, or you can make a bigger recipe of sauce or bechamel. It will be delicious in any case. Grease your baking dish generously with butter. Then starting with meat sauce spread a layer at the bottom of the dish. Then place a layer of lasagne noodles on top of that, followed by a layer of bechamel. Top that with a nice sprinkling of the shredded fontina cheese. Continue the layering process, meat sauce, lasagne, bechamel cheese, until you run out of the ingredients, or your dish is full. End with a layer of bechamel, and give that a nice sprinkling of parmesan cheese on top. Your lasagne is now ready to go in the oven. Preheat your oven to 375 degrees, and let the lasagne bake for about 40-45 minutes. Let it stand about 5 minutes before serving. You are now ready to enjoy, perhaps with a nice green salad and a glass of red wine to accompany. Buon Appetito! 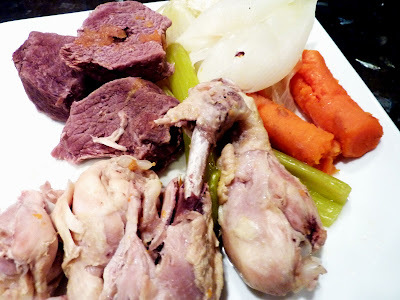 Start by laying all vegetables and meats at the bottom of the pot. Continue by filling the pot with water, do not fill to the top, just 1 inch more than its half. Cover the large pot with a lid, but letting a little gap on the side to let the steam out. Let the soup simmer at low/medium heat for about 2 hours or until the meat is tender to the touch and the vegetables begin to break down in the broth. At this point , I like to transfer my broth to a smaller pot. 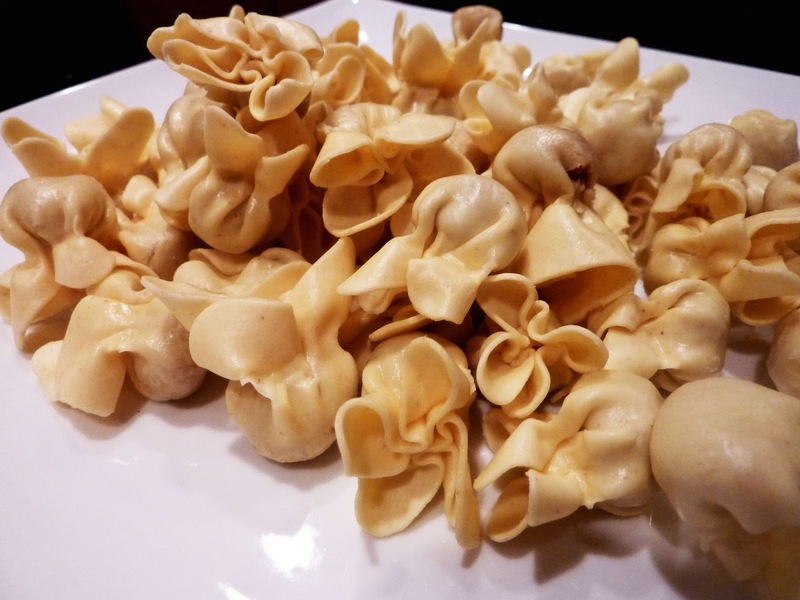 I will use the broth to cook with small meat tortellini, or ravioloni or filled pasta of choice. (I love fagottini with prosciutto and parmesan cheese filling). When your soup with pasta is ready , you can serve it as a "primo" ( first course), while the boiled meat, with some veggies and sauces to garnish can be served as a "secondo" or second course. Enchiladas suizas have been a part of Mexico's food tradition for a very long time. They are thought to date back to the area which is now Mexico City even before the days of Spaniard Hernan Cortez. The word suiza is Spanish for "Swiss", which refers to the the Swiss immigrants in Mexico who had established dairies and cheese production in the country. Thanks to them, these enchiladas are often topped with a sour cream like sauce, or as I prefer, a generous crumbling of queso fresco or cotija cheese. Enchiladas have three basic components, tortilla, some type of filling, and a spicy sauce. The word "Enchilar" in Spanish means to make spicy. 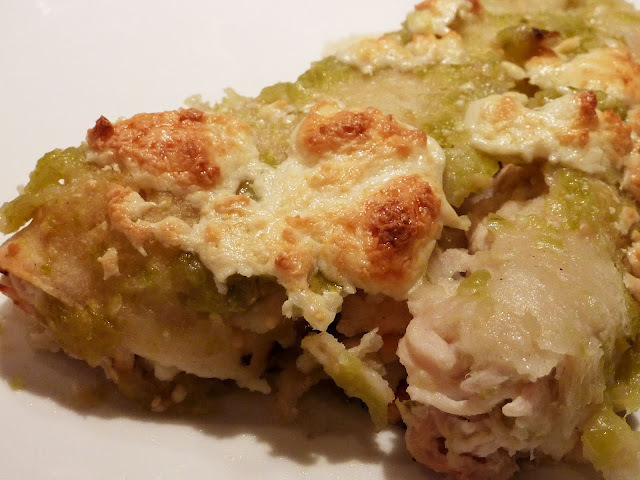 In the case of enchiladas suizas the tortilla should be corn, the filling is chicken, and the sauce is a spicy green tomatillo sauce. The result: delicioso! As are many of my favorites, this is a great make ahead meal, and can be made in large quantities to feed a crowd. When you buy the tomatillos, a strongly advise you to go to an ethnic market or ranch market, you will get fresher tomatillos, and spend half the money. Your mainstream supermarket will consider this a specialty ingredient, charge you twice the price,and the product doesn't move, so you will lose freshness. Venture out! So roll up your sleeves and get started, your enchiladas are going to be tasty. about 3/4 - 1 pound shredded cooked chicken (I go to Costco and buy a rotisserie chicken, and use all the meat from that. Easy, flavorful,and moist. 12 oz. queso fresco or cotija Mexican cheese. Use more or less, depending on your desired taste. First, prepare the tomatillo sauce. You need to boil the tomatillos and chile. Fill a large pot with salted water and bring to a boil. When the water is boiling hard, put the tomatillos and the serrano chiles which you have stemmed, and removed seeds. Boil them for about 5 minutes, then drain and cool. Next, heat the olive oil in a large skillet. Add the onion and garlic and saute until the onion becomes nicely golden. Then, put your onion and garlic into your food processor with the tomatillo and chile mixture and blend the mixture until it is a somewhat chunky puree. It should be smooth enough to hold together, but not overly processed. To finish the sauce, heat another tablespoon of olive oil in the same skillet you used to cook the onion and garlic. When it is hot, add the tomatillo/onion puree and stir it constantly for about 5 minutes over medium heat. The sauce should thicken and darken somewhat in color. Now add about a cup of the chicken broth to the sauce, stir well, and let simmer for about 10 minutes. Stir the sauce ofter. If it seems too watery, continue to simmer until desired consistency is reached. If it is too thick, add additional broth. At the end, stir in the chopped cilantro and salt to taste. 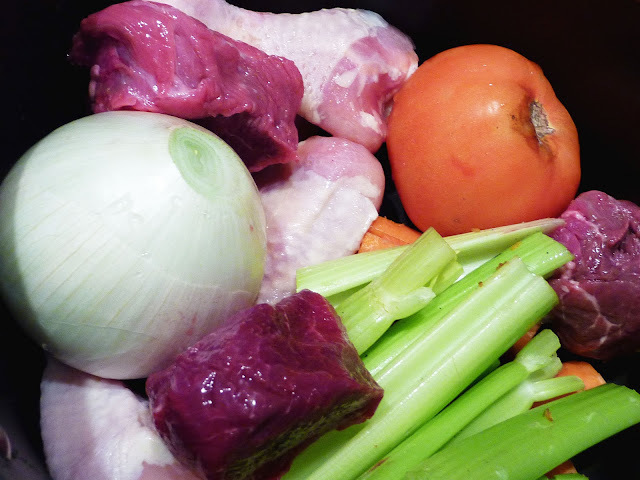 You will not need to put much salt,as the sauce is really flavorful, and the broth will have salt already. Your sauce can be made a day in advance if you need. You are now ready to assemble the enchiladas. I usually use a 9 x 13 inch glass baking dish. Use whatever oven proof baking dish you desire. Right before making the enchiladas you need to steam the tortillas, I do them 4 or 5 at a time in the microwave.Just put them in a plastic produce bag with an air hole to vent, and microwave them for 30-45 seconds. To get the chicken ready, I put the shredded chicken in a mixing bowl, and a add about a cup of the sauce mixture and stir to combine. You want the chicken to be nice and moist with sauce, but not soggy. You also need to save yourself enough sauce to top the enchiladas at the end. Roll a portion of the chicken filling into your tortillas, and lay them in the baking dish side by side. When done, blanket the tortillas with a nice coat of remaining tomatillo sauce. Generously crumble the queso fresco or cotija cheese over the top. Bake in a 425 degree oven for about 40 minutes. At the very end, turn on the broiler, and let the cheese on top get that golden brown color. Be careful not to burn. Your enchiladas are now ready to serve. They can be served alone, or with some rice, beans, or salad as a side. Serve with a nice cold Mexican beer like Bohemia or Negra Modelo. Buen Provecho!